Featuring a full-color, 2.4" touch screen display, up to 24* hours of battery life on a single charge, and QuickCharge™ technology. The MiFi 7700 gives you all-day power for surfing the Web or catching up on email without a mid-day re-charge. Put it in standby mode and you‘ll conserve battery life for days without ever needing to plug in. 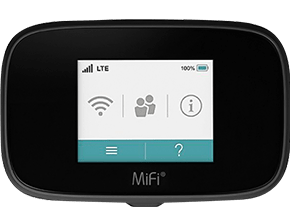 The MiFi 7700 also doubles as a portable charger for your phones and tablets. *Battery life may vary depending upon number of connected devices and activity.